What would you do if you won millions in the lottery? Seriously. It's a conversation that DB and I have now and again, revising our list from time to time. I don't think we're alone in this idle moment pursuit - playing with the fantasy of having lots of money to do things with, for ourselves, for others... And, would you tell anyone? From time to time there are articles that tell of the outcomes in the lives of people who are suddenly wealthy from lottery wins, and fairly consistently, they're not necessarily positive. Years ago, a workmate of my ex-husband's won $1.5M in the local Lotto. He immediately resigned from his job, they bought a house in a nearby coastal suburb, and began to live the life they thought they wanted. Not very long after, we heard they'd sold that house and moved to Tasmania to grow apples. After that, we lost touch with them, and I have no idea what happened to them. Thing was, in quitting his job, he found he had nothing to give his life the routine he was used to; in moving from the neighbourhood where they'd lived for years in their rented public housing townhouse, they lost their community; in other words, they lost themselves. I don't know if growing apples in Tasmania worked for them. I like to hope so. It was the cover that attracted initially to this book - as I said to the staff member in Oscar's and Friends yesterday (a bookshop across the road from the dry cleaners...REALLY...what's a girl to do...?) I think I have a bit of a thing for buttons... She laughed and agreed, said she had this one on her TBR pile too. It's also just a lovely little book - a glossy hardcover in amongst the many paperbacks. It begged me to pick it up - truly it did! Jocelyne is 47, married to Jocelyn (Jo) - the one in goodness knows how many chances that she could meet someone with the same name... She has a small haberdashery shop in Arras, France, and a sewing blog. Her children are grown and living their own lives. Her life is ordinary - the kind of ordinary most of us would understand. She's not unhappy, but she is starting to wonder what happened to the dreams she used to have, and if this is as good as it's going to get. She still loves Jo, although that has been tempered by years of marriage, ups and downs, the stillbirth of their third child and Jo's subsequent rage and abuse over many, many months before he got it out of his system. They have regular holidays, weekends away, and she has come to understand that ordinary is OK, maybe. Then she wins a bit over eighteen million euros in a lottery - encouraged to enter by her friends, the twins who run the hair salon next door to her shop. Even when the new stories start to appear, saying an unknown person in Arras has won but has yet to claim, she says nothing. It's not until the deadline is nearly up that she manufactures a reason to go to Paris, to the lotteries office, to claim her winnings. As far as Jo knows, she has gone to meet with suppliers. At the lotteries office, she meets with a staff psychologist who warns her of the negative aspects of suddenly coming into a lot of money, the potential pitfalls, and the things she may need to do to protect herself. On the train home at the end of the day, Jocelyne finds herself reviewing HER list of desires...and Jo's... The idea that, now, she could make it all happen doesn't seem real, or even wise. She doesn't know what to do. If she tells Jo about the win, will she be able to control the changes that will be inevitable. Will they be good changes, or not? Will the Porsche, large flat screen TV, a nice fireplace for their living room, the complete James Bond DVD set and a Seiko watch be enough to make him happy, or will it just start a continual want for more new things, and even, the desire to leave all they have built over the years behind - all of it...including her? As the weeks go on, Jocelyne holds on to her secret. She starts to lose weight, stressing about what to do. She reviews her list of desires, and realises that she loves her little shop. The blog is growing and she is interviewed by a magazine interested in the success of a blog that is about the ordinary stuff of sewing - which increases her exposure. They start an online business linked to the shop and that starts to grow exponentially. She employs people. Jo appears to be happy about her success, and takes her away for a weekend. They make love gently again - the violence that was part of his anger and anguish that has had a residual effect over the years seems to be gone. She contemplates perhaps donating money anonymously. She re-evaluates her marriage and how she truly feels about Jo, realising that for all the ups and downs, all the changes, all the dreams that didn't happen, they still built a life, and it is OK.
Jo achieving his list has always been tied to him moving up to a foreman's position in the ice cream factory where he works, and to that end, he's been taking training courses over the years to get accreditation for the promotion. 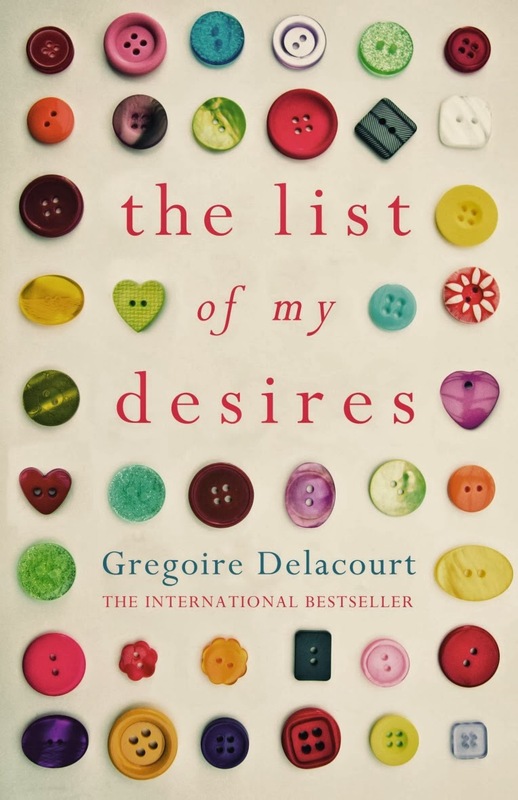 So when he says he's reached the final stage and has to go to Switzerland, to HQ, to do the final course, she packs him off and spends the first part of the week re-reading Albert Cohen's Belle du Seigneur, a nineteenth century romance novel that is a touchstone book she's revisited many times over the years. She also realises that not being able to have all the things on a list at once is part of why we keep going from day to day, working towards achieving them a bit at a time. They are part of what gives us a future. Quite what it is that makes her realise that Jo's trip is not what he said it was, she doesn't know. She just knows when she wakes up the morning after finishing the book that he's really gone, that he's found the cheque and gone...able, by scratching the 'e' off the end of her name to cash it for himself. Going into the wardrobe, she checks her shoe, and it's empty. He must have found it when he made a repair to the hanging rail. She calls his factory, to be told he'd taken a week off and was due in a couple of days. She calls HQ in Switzerland, only to be laughed at for assuming that they'd bring regional workers so far for promotional courses. She pieces together their last few weeks together, able now to read different motives into Jo's actions. Now, she realises that all her forebodings about the potential harm the money could do to them have played out, albeit in a way she couldn't have predicted. Because she never told anyone about her win, there is little she can tell about what's happened either - just that Jo has gone. She makes a decision to sell the shop, to hand over the running of her blog to the staff she's employed, to go away from Arras. She goes to Nice, taking refuge in a retreat where she had gone after the still birth years before. She realises that Jo's acts have truly killed something in her - and while, unlike the heroine in Belle du Seigneur, she won't act out the wishes for everything to end, she does need to be taught to live again, albeit differently. There is a lovely clarity in the prose, and both a simplicity and immediacy in the storytelling that I found particularly appealing. There are too many books that are described as telling stories about ordinary people that end up feeling like the people are characters in some unlikely play. In this case, the people really are ordinary - we all know Jocelynes and Jocelyns, and young women like the twins who run the hairdressers next to Jocelyn's shop, and the range of personalities who patronise the haberdashery shop. We would all recognise similar internal 'what if' conversations that plague Jocelyne - before and she wins the money, and the imagined ones afterwards. AND, it's a particularly lovely little book, as I mentioned earlier! I'm not going to divulge what happens in the end...that's for you, if you're intrigued enough, to find out by getting your hands on a copy, which I would genuinely recommend!